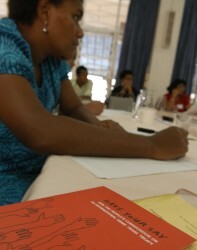 From 18-19 April 2007, I was in Fiji for a people’s consultation on the proposed global Arms Trade Treaty, basically a workshop convened by the Pacific Concerns Resource Center (PCRC). This was the only people’s consultation held in the Pacific region to help draw public attention to the need for governments to provide feedback on the scope, feasibility and need for stronger government restrictions on transfers of conventional weapons. Next Step Productions (NSP) promotes human security, particularly efforts to tackle landmines, cluster bombs, and other weapons. NSP Research – Updates is powered by	WordPress 2.9.2 and delivered to you in 0.083 seconds using 22 queries.